The Fellowship was fortunate enough to obtain a copy of LORD OF THE JUNGLE #4 from Dynamite Entertainment. Arvid Nelson writes the story with art by Roberto Castro. The comic is based from the Edgar Rice Burroughs stories. While Cecil Clayton and Jane's father are in the jungle trying to find her, a French warship discovers the castaways' camp and lands and joins the search. Meanwhile, Tarzan and Jane are drawing closer to each other. Unfortunately, the rescue party needs rescuing themselves. Will the ape man be in time to help, or does he have his own agenda? This is an interesting take of the character. I am only familiar with the comics and movies, not the original Burroughs tales so my true knowledge of the character is limited. Tarzan can speak the ape language, yet read and write English? I guess it’s possible. Speaking ape makes sense, I just don’t know about him having knowledge of English just from books. Jane seems to have fallen in love with Tarzan WAY too quick, but I guess I can overlook that. Castro’s pencil work is excellent. Some pages look like they came out of the classic pulp books. Despite my nitpicking, this was a good read. I definitely want to keep tabs on this book. 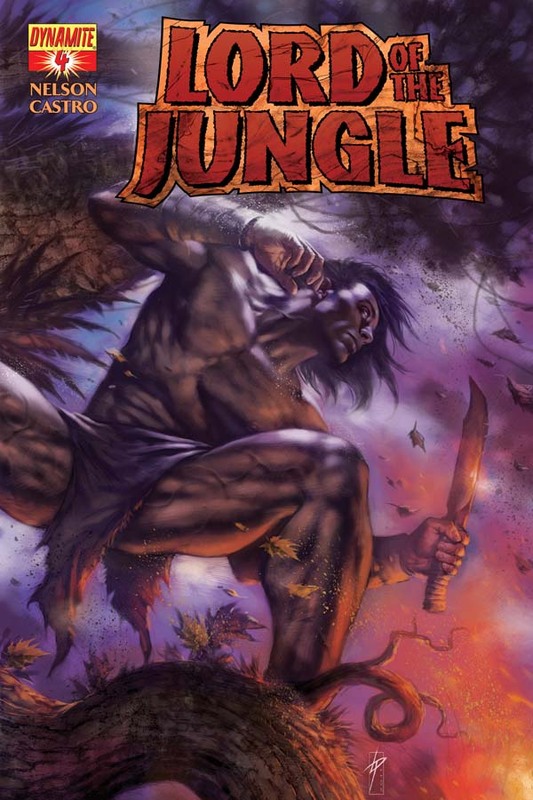 LORD OF THE JUNGLE #4 is in stores now and is available at www.dynamite.net.